radiance saturates the crystallized purity. making these four sacred beings shine. The “dark essence” refers to the spirit of the north, which in Chinese tradition is associated with water. The “four sacred beings” are the pictures of four mythical creatures on the surface of the mirror. The remarkable design and symbolism of this transitional mirror places it in the category of a significant cultural object of the period. The design consists of four masterfully cast divine beasts representing the Four Directions of the compass. The Four Divine Beasts was a design motif used from the Han until the Sui to Tang periods. Early examples of pictorial representation of these animals may be found in stone objects of the Northern Wei dynasty (386-534 AD). An archaic form inscription is located on the central band. The obverse side is in remarkably well-preserved condition with some green patination present. The reverse side has been conserved professionally with only a small area of brown patina remaining. In our opinion, this mirror is an exceptional example of the Sui to Tang Dynasty. 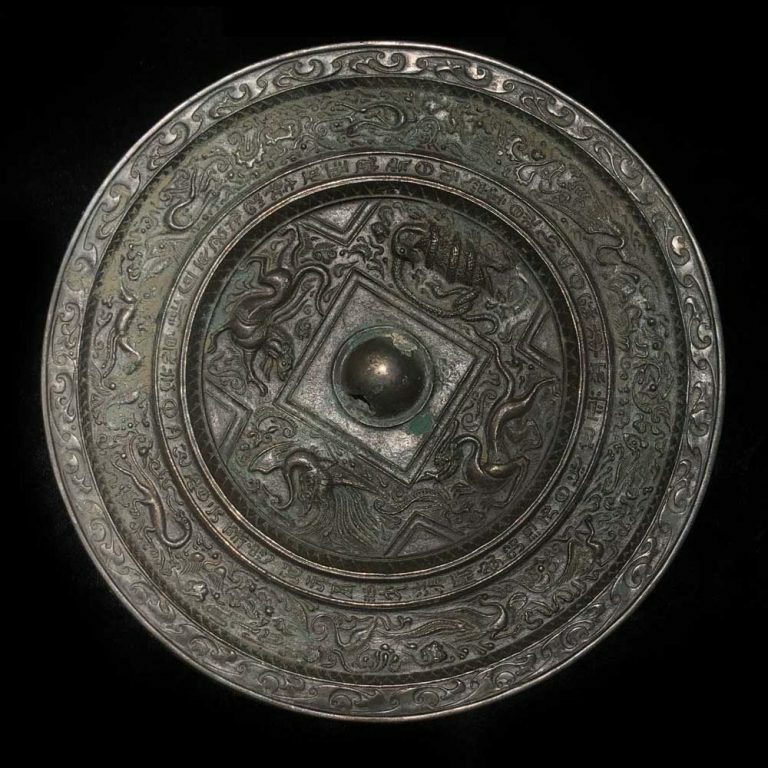 For a related example of the period depicting the four divine animals see Bronze Mirrors from Ancient China, The Donald H. Graham Jr. Collection. Toru Nakano Editor. Donald H. Graham Jr. 1994. Catalogue number 68, (M34).